A major construction project in Sun City Center may have extinguished the annual fireworks show this year, but residents will still have a chance to catch a show indoors with a live telecast of fireworks from Washington, D.C., on July 4. A pancake breakfast is also planned, and it’s open to the public. The $2 million member-approved renovation of the Atrium Complex, as reported by Penny Fletcher in The SCC Observer earlier this year, includes a new information center, a multipurpose building and more than $800,000 in improvements to the parking lot, lighting and other parts of the complex. The Sun City Center Community Association board of directors decided in April to cancel the fireworks show after reviewing plans for the ongoing construction. With fencing around the new parking lot eliminating many of the viewing positions that had been popular with residents last year, and a review of the lack of nearby parking spaces, the board decided to hold off, and instead have the indoors telecast. “We canceled the fireworks for safety reasons, since we have a lot of major construction in the area,” said Sam Sudman, vice president of the board of directors. The construction is expected to be complete by December. The fireworks company that had contracted for the event agreed to the change with the understanding that they would have the contract for next year’s July 4th show. Association members looking for a fireworks fix can still watch a televised show live from Washington, D.C., in Community Hall. Members are invited to bring blankets and chairs to add to the festive atmosphere. Seating will not be provided. Due to space limitations, this event will not be open to the public. For those looking to start their Fourth on a full stomach, $5 will get you a pancake breakfast Friday morning, July 4th, in Community Hall, 1910 S. Pebble Beach Blvd. Doors open at 7 a.m. with food served until noon. Sudman and his wife Joanne are organizing teams to work in the main hall and in the kitchen for the event, which is expected to draw more than 1,000 people. Teams will work in two- to four-hour shifts. For more information, call the Sudmans at 813-633-3106. Proceeds will go to the 2015 fireworks display. Check out next week’s paper for a full roundup of area fireworks shows. 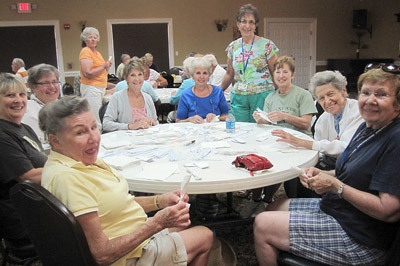 Volunteer wrap cutlery in preparation for the 4th of July Pancake Breakfast at Community Hall.